Hospice care provides comfort and medical intervention to those who are in the final stages of life. Many people who have terminal illnesses or have been in life-threatening accidents may choose to use this type of care as a peaceful way to manage end-of-life pain while still remaining in their own home or a hospice facility. Hospice care can take place in a facility or more commonly, in the patient's home. Depending on the level of care needed and the patient's pain levels, a hospice patient may have an in-home attendant or various staff that are typically on call. The treating staff members will come up with a plan to best care for the patient and adjust according to the patient's needs. A typical day may include check ins and appointments with nurses, their doctor, a speech therapist, an occupational therapist, and psychological counselors. Volunteers may also play music and read to the patient if they are in a facility setting. Staff may include the treating physician, specialized physicians, nurses, counselors, and volunteers. Working together, these professionals create a customized plan to best care for the patient. Staff members can have varying shifts depending on their employer's policies. Some hospice staff work 24 hour shifts, while others employ night shift only professionals and separate day shift professionals. The ultimate goal is to make sure whoever the treating staff member is gets plenty of rest and time for self care so they can best treat the patient during their shift. Medical staff may help coach family members and answer questions when it comes to visiting the patient. Counselors and members of the clergy may provide psychological support throughout the process for the patient and their family members. After your loved one passes away, a medical professional will pronounce the death and document it in the client's records. The family is able to speak with the treating staff about religious preferences or customs that they would like observed. Typically, families are allowed to spend time with the deceased and begin the process of grieving. The body may be bathed and dressed when the family is ready, and paperwork will need to be filled out. Families who are having a funeral may contact a funeral home or a have a staff member do so. Hospice staff provide counseling, support, and resources during this overwhelming time. If the patient is not receiving hospice care in their home, they may be at a nursing facility, in a hospice facility, or in a hospital. Family visits are typically encouraged, and each facility will have its own visiting hours. 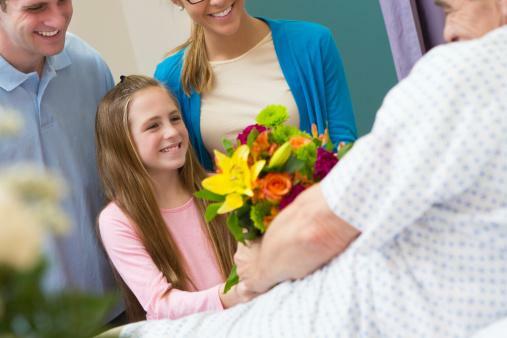 Having friends and family visit can be an uplifting moment for the patient and may remind them of how loved they are. To prepare for a visit, remember the patient may look different from what you are used to. If you are taking children to visit them, help prepare them for what they might see, smell, and hear. Depending on the facility, family members may be allowed to spend the night with the patient. Some rooms will have a designated space for relatives to stay, while other facilities may be lacking in terms of space for relatives to spend the night. You may also want to consider whether the person in hospice has a single or shared room as this may impact your quality of sleep, privacy, and comfort level if you spend the night. Hospice facilities may also have rooms specifically for family members to go if they need a break during their visit. Seeing a loved one in hospice care can be emotionally draining, and many facilities take this into consideration. These rooms may have snacks, beverages, and activities for younger children. The goal of hospice care is not to cure the patient, but to make them feel as comfortable as they possibly can in a dignified setting. Medical care may include short and long term pain management, psychological support, and various beneficial therapies such as speech and occupational. Hospice care can be a great option for those who would like to pass away in their own home or an appropriate facility in a pain-free way while being cared for by compassionate professionals. Hospice care aims to treat patients with dignity throughout the final stages of their life.